« Who do you admire the most? If you think the number one reason why I admire Rogério Ceni is the fact that he has scored 76 goals so far in his career? You are wrong. If you think that it is because he has been a loyal SPFC goalkeeper for the last 17 years, you are still wrong. If you think it is because the has received the award Bola de Prata 4 times and has been nominated this year to run for The World’s Best Soccer Player of the Year Award along with Ronaldinho Gaúcho and Kaka, I am sorry, you are wrong. Obviously, all these three reasons do contribute to his being my idol, but the number one reason why I worship the guy is his life off the soccer field. In his free time, Rogério is known for helping institutions in need, not with money, but with his time. He often visits orphanages in poverty-stricken neighborhoods and spends time with them, talking to them about the importance of sports in a person’s life. 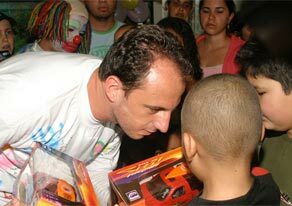 This last October,for instance, Rogério participated in a party promoted at CACCC (Centro de Apoio à Criança Carente com Câncer), where he distributed presents and autographs to children, who, if not for his good will, would never have the chance of meeting a celebrity otherwise. To me, it is not enough for a soccer player – or any other sports celebrity for that matter — to be a whiz at what they do in the field only. For the guy to become an idol, he needs to go the step further and show the world that he is as admirable outside the soccer field as well. And Rogério Ceni has certainly accomplished that feat. He is, by far, one of the most well-rounded sports celebrities I have ever come across in my entire life. Go, Rogério, Go! I admire Rogerio too. I knew that he helps poor people and donates money to charity. But I didn’t knew that he did much more as you said. He does not only gives money to them, but he also spend time. What I think is the most important, you know? Because he does it with the heart. So, cool, I really admire him either.